Fred Beltran is active in several creative fields. He works as a comics artist, but also as a prolific musician. Beltran saw his first comic album published in 1988. 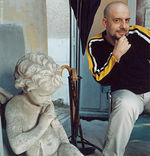 In the early 1990s, he contributed to the collective album "Eros Gone Wild" at Humanoids and pursued a subsequent career in architecture, illustration and theatre stage design. Since 1994, Beltran has mostly used the computer on all his comics work, including the coloring of the series "The Technopriests." Also in 1994, the first album of his new band Les Snails is released. Beltran cooperated with the Japanese publishing house Kodansha between 1995 and 1997, producing the series "Nina." In 1998, he began a new series with Jodorowsky, called "Megalex," (Humanoids) and in which he used both hand-drawn and computer-generated illustrations.